Most Tesla owners are well aware of Supercharger etiquette. It even came in focus last month when a Model X blocking 3 Supercharger stalls caused a small uproar in the Tesla community. While not blocking several parking spaces is basic parking courtesy, when it comes to Superchargers, there are also some electric vehicle specific aspects. Ideally, you don’t leave your car plugged in at a stall for too long after it’s charged in order not to inconvenience anyone in need of a quick charge at a busy location. In the past few weeks, Tesla even started implementing a notification system through its app in order to alert owners that charging is completed and to please move their car. Someone might be ignoring those notifications on their phone since a Model S has been reportedly abandoned at the Colorado Springs Supercharger for “weeks”. 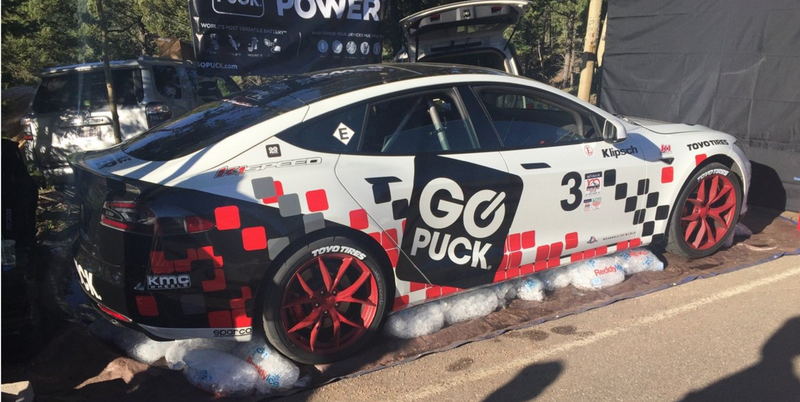 And it’s not any Model S, but the record-breaking GoPuck Tesla Model S that won first place for a production electric vehicle at the Pikes Peak Hill Climb last month. Blake Fuller, CEO of GO Puck, was the driver of the vehicle and he is presumably the owner. His 11:48 run, which you can watch in full here, was enough to break the record for fastest production electric car to make the Pikes Peak Hill Climb. Pikes Peak is only about 12 miles from Colorado Springs. Tesla owners took to the forums this week to complain or at least discuss what is going on with the vehicle utilizing the Supercharger for the past few weeks. We have reached out to Fuller yesterday via his publicist and through Twitter to ask what is going on, but we haven’t heard back yet. The Colorado Springs Tesla Supercharger has 8 stalls and they are reportedly rarely all in use at the same time, so hopefully, it will not become a problem. Also, the Supercharger is located in the Cascade Parking Garage. Tesla has a deal with the propriety manager for free parking for an hour while charging, but outside of the arrangement, there’s a fee.